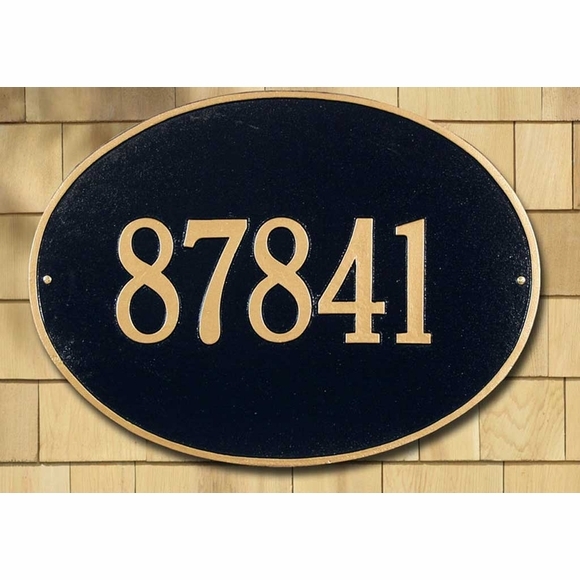 Hawthorne 19x14 Oval Home Address Plaque - - one line or two line personalized estate size with room for large house numbers. Made in USA. The one-line version holds up to four jumbo 7" numbers or five 4.5" numbers. The two-line version holds up to five 4.5" numbers on line 1 and up to seventeen 1.75" characters (including spaces) on line 2. Colors (from left to right in small images): AB antique brass; AC antique copper; BG black with gold characters lawn mount & wall mount; BS black with silver characters; BW black with white characters; GG green with gold characters; OB oil rubbed bronze; OG bronze with gold characters; PS pewter with silver characters; red with gold characters; and WG white with gold characters. Estate size oval personalized address plaque for wall mount or lawn placement. Also available in a three line version (see Related Products).